we go here to eat rice! The set is extremely affordable. Set Nasi Lemak is just under RM10 but the best thing about this is the accompanying crispy, sizzling, freshly fried, FRIED chicken! 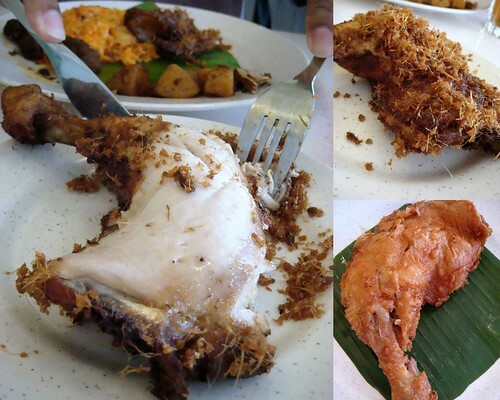 For variety, try the lemongrass fried chicken – the herbs are superb.. so good you end up eating the skin first (as in the picture above). This place is also famous for their assam laksa. I am not normally a fan of the assam laksa because I find most assam soups in KL thin, lacking in fish and taste. Add the ‘har-ko'(black prawn paste) and take the flavour up a notch. 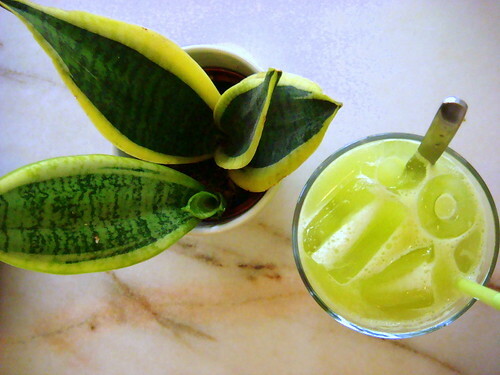 ..because you will need it once you have finished guzzling your assam laksa sauce! how come never asked me go eat rice one ? Yummss..even Unka said the Nasi Dagang is good! So the sambal spicy or not?? have something to do in bangsar in the morning!!! After reading your post, I am looking forward to it! Hey that's my assam laksa! FBB ate it! The rice was nearly gone.. lol. No lar, can u see the yellow splodge in the background? The actual nasi lemak was gone .. so there was only the briyani nasi left. 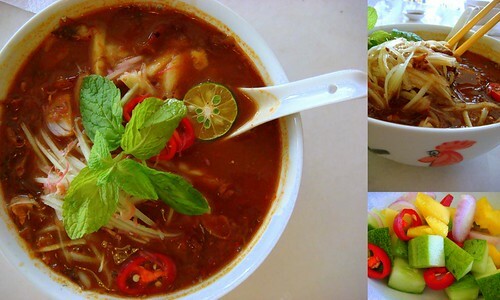 'The Assam Laksa soup at Rice Cafe is so thick you can do a head-stand on it' whoa… I'm so gonna try this!! I love thick assam soup! I'm tempted with the assam laksa! 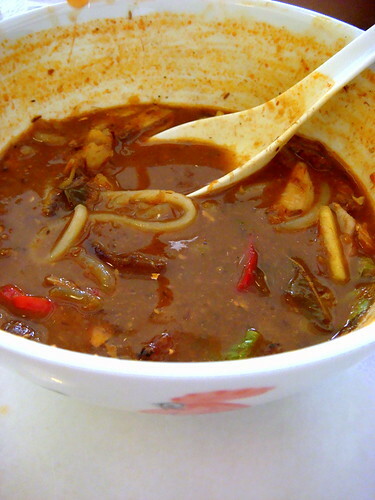 thick asam laksa soup with lots of fish meat? WOW you're not kidding… that soup is liquid GOLD! The fried chicken looks mind bogglingly gooooooooooood! yar man- esp the fried chicken!! the assam laksa is FULL of fish! The fried chicken is what I can understand while the rice is something new to me. Looks good..